Overall, there is consistent evidence that the level and quality of parental involvement in learning is linked to a child’s communication, language, and literacy capabilities. In addition, there is evidence that efforts to support parents in helping their children learn have the potential to improve outcomes for children. However, not all approaches appear to be effective, meaning that it is important to think carefully about how to promote parental engagement. 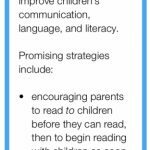 Effective parental engagement is challenging but has the potential to improve children’s communication, language, and literacy. – running workshops showing parents how to read and talk about books with their children effectively. Less promising strategies include occasional home visits or homework tasks.